"A lovely tribute to Dad" -- Brian Clough's daughter, Elizabeth. "Some of the most revealing and genuine tributes to the Great Man" -- Nottingham Forest matchday magazine. "A must have for those of us who loved Brian Clough" -- Derby County Mad website. "An absolute joy - a lovingly compiled book of encounters with the Great Man" -- Middlesbrough fanzine. 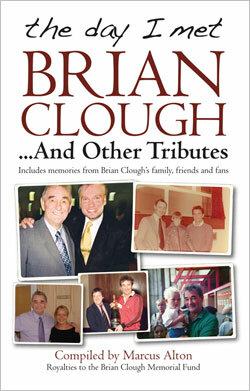 Brian Clough's family are among the many people who describe their personal memories of him in this unique collection of tributes (published October, 2011). Fans may think they have heard all there is to know about Cloughie. But this book has many untold stories and tributes, demonstrating how he touched so many lives and won admirers around the world. The book has memories from Brian's widow Barbara, his daughter Elizabeth and his brother and sister, Joe and Doreen. They give a rare insight into life with the Master Manager. This collection of anecdotes and tributes includes contributions from fans, friends and former players. It has been compiled by the editor of this website, Marcus Alton, whose royalties have helped to raise hundreds of pounds for the Brian Clough Memorial Fund, which has been run by the Clough family for the types of good causes that Brian supported. Any further royalties will go to a charity that Brian and Barbara supported. If you purchase a signed copy through this website (signed personally for you), you can now benefit from a special offer of 25% off. This special discount means the cost will be just £7.49, plus postage and packing in the UK at £3.00. You can also purchase unsigned copies. In the book, one of Cloughie's first signings at Hartlepool describes how he poured a bucket of water over the Master Manager - by accident! Terry Bell says he was planning to get his revenge on a team-mate who had cut the toes out of his socks. "I decided to climb up onto the roof of the dressing room with a bucket of water," says Terry. "Some of my team-mates would then signal to me when the lad in question was walking past and I would throw the bucket of water over him. So I waited and finally got the signal – but unfortunately it wasn't who I expected! Guess who was walking by? I poured the bucket of water over Brian Clough! "To make it even worse, he wasn't wearing his tracksuit. He was going to a funeral that day so he was wearing a suit. And it got absolutely soaked! As a result he fined me a week's wages." Usually priced at just £9.99 (but now with 25% off through this website), the book is great value. There have already been signing sessions at Waterstones in Derby and WH Smith in Nottingham, plus the Book Boutique, a leading independent bookshop in Ripley, Derbyshire. 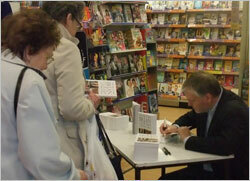 Marcus signed copies of the book at WH Smith in the Victoria Centre, Nottingham, on Saturday October 29th, 2011. 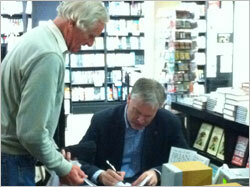 He also presented a highly successful Cloughie evening at Waterstones in Derby on Thursday, November 3rd, 2011, when he read extracts from the book and talked about the times he met the Great Man. He returned for another signing session at Waterstones on December 17th, 2011. During the evening event at Waterstones, fans were able to listen to archive Cloughie interviews and hear previously untold stories about Old Big 'Ead. Afterwards they were keen to ask questions and share their memories too. 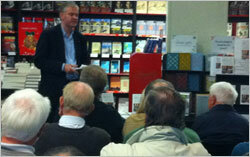 Marcus has been interviewed about the book on BBC Radio Nottingham and BBC Radio Derby. The book has also been serialised in the Nottingham Post newspaper and there was a special report in the Derby Evening Telegraph. The fans website, Derby County Mad, described it as a 'must have' for all Clough fans. It said: "There are 189 pages of pure enjoyment as the tributes and stories of meeting Brian Clough come thick and fast." The reviewer added that it was a book, "you will not want to put down." The book is now sold-out at WH Smith, Waterstones and the Nottingham Forest Megastore, but you can still buy it on this website, using the Paypal button at the top of the page.